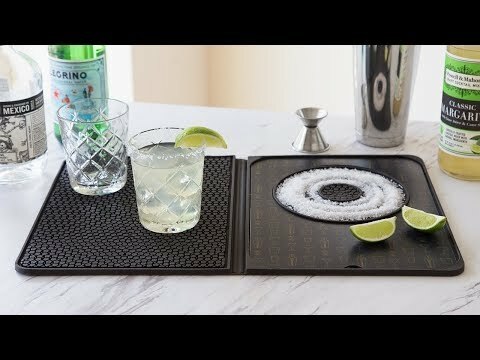 This cocktail bar mat gives your bartending duty a new sidekick. It’s designed to make mixing up drinks an easier and more streamlined process. There’s space to cut and zest garnishes, a recessed rimmer to add a finishing touch to drinks (like sugar or salt), and a spill-containing zone that dries glasses, too. Dimensions: 11.75" x 18" x 0.5"
I got it for my husband to use. It keeps the water or drinks from being all over the counter. Makes my margarita making much better. This bar mat is very compact and easy to slip in your suitcase when traveling. Used it on Xmas, every thing I used was all together, saved time and clean up. Have suggested it to friends of mine. I bought 3 of these for gifts and all 3 used them for the holidays and loved them. They said they were very functional, perfect size, loved the setup and they were just in time for their holiday parties. 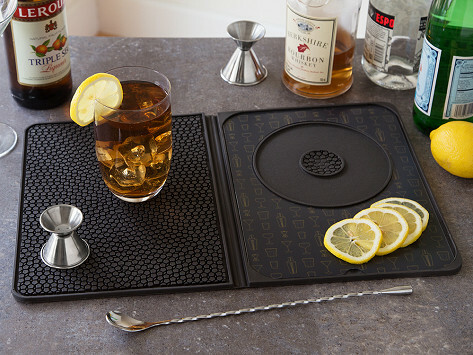 The multi-use cocktail bar mat from Talisman Designs makes it easier to up your drink-mixing game. The mat covers some bartending functions from prep to clean-up and a few steps in between, too. The mat is divided into two work zones to help set up drinks, then handle clean-up afterwards. A removable plastic cutting surface is for zesting and cutting, while a built-in rimmer gives drinks an extra-special finish (like sugar, salt, or cocoa). The rimmer can also serve as a storage spot for prepped garnishes. The mat’s second zone focuses on keeping bar duty clean. It’s made to corral spills and provide a drying spot for just-washed glasses. When happy hour is over, the BPA-free mat can go in the dishwasher, and then store flat until it’s time for the next round.